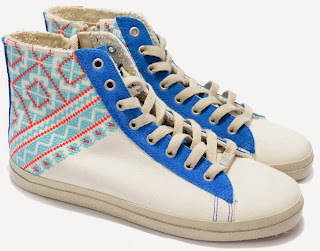 In the hopes of taking a much needed mental break from all the snow and winter boots, we offer a bit of bright, casual shoe fun from and LA-based fashion label (believe me we need the warmth), a la today's Shoe of the Day. This shoe also highlights something we're seeing a lot more in footwear - PRINTS!! The Kim & Zozi Woven Sneakers (above in white) features a leather and canvas upper, a braided thread design that gives the sneaker its tribal design details, cotton and leather lining and rubber outsole. This print-perfect style also comes in black, light blue, navy, and yellow and pairs perfectly with a dress, jeans, shorts or with anything you feel needs a touch of cool. The Woven retails for $145.00, get yours at KimandZozi.com.